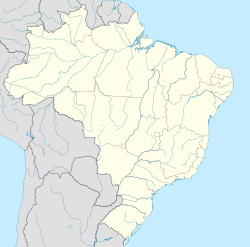 Campinas (Portuguese pronunciation: [kɐ̃ˈpinɐs], Plains) is a Brazilian ceety o São Paulo State, in the kintra's Sootheast Region. Accordin tae the 2010 Census, the ceety population is 1,080,999, makkin it the fowerteent maist populous Brazilian ceety an the third in the São Paulo state. The ceety's metropolitan aurie, the Greater Campinas, as o 2013, conteens nineteen ceeties, includin Campinas, an haes a total population o 2,232,297 fowk. The ceety is hame tae the Varsity o Campinas, ane o the maist prestigious in Laitin Americae. ↑ "Malito torna-se cidade-irmã de Campinas". www.campinas.sp.gov.br. Archived frae the oreeginal on 2007-05-04. ↑ 4.0 4.1 "Campinas assina acordo de cidade-irmã com Cascais em Portugal". Retrieved July 9, 2012.